Our workshop is primarily for educators, administrators, and anyone working in the educational system but the door is open for anyone. The promise of ending educational inequity and the achievement gap rests upon teachers, educators, researchers, and community activists in Deaf education who are committed to social justice and multiculturalism. This seminar will give participants space to become acquainted with one other’s role and their experiences. This time will also enable us to understand the true meaning of “Social Justice” and brainstorm how we can work together. The seminar includes a presentation, a demonstration of what a multicultural curriculum geared towards Deaf and HOH students should include, recommendations, and the opportunity to exchange ideas and stories. Sessions will be facilitated by former multicultural/diversity specialists, former/current teachers (k-12, college), administrators, curriculum developers, and researchers. This is an excellent opportunity for school administrators, principals, diversity specialists, counselors, and especially teachers, to learn how to infuse multicultural perspective in the curriculum used in schools- one that will benefit the school and community as a whole in promoting social justice. A better understanding of we can do as an alliance to push for Social Justice in Deaf Education. 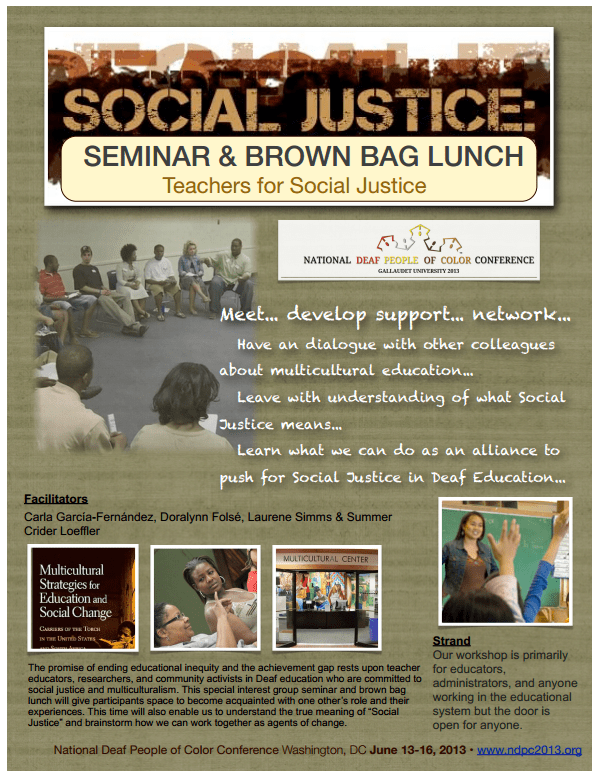 This seminar is part of the National Deaf People of Color conference and is scheduled for Saturday, June 15th, 2013. Be advised that brown-bag lunch is separate from the conference registration. The cost of the brown-bag lunch seminar is $10 per person. Collection of funds for food & food preferences/restrictions will be collected at the beginning of the seminar.